I love stripes so when I was looking for ideas for a 4th of July table cloth, I knew there were red and white stripes in my future. 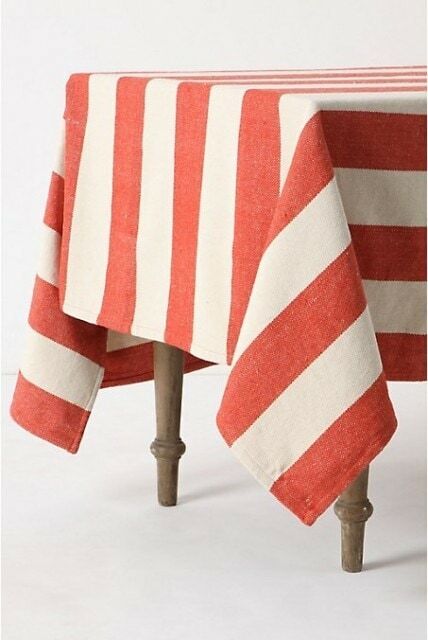 I have been in love with this striped tablecloth from Anthropologie since the first time I saw it, but it is no longer available to buy in the store. Even when it was, it was pricey. So I thought I would try making one of my own! I love a good crafting challenge. Here is the version that I made with the help of my daughter. I purchased a white tablecloth from Target and then pre washed it. I knew I was going to need a lot of red textile paint so I ordered it online from Dharma Trading Co. I order 32 oz. of the True Red. 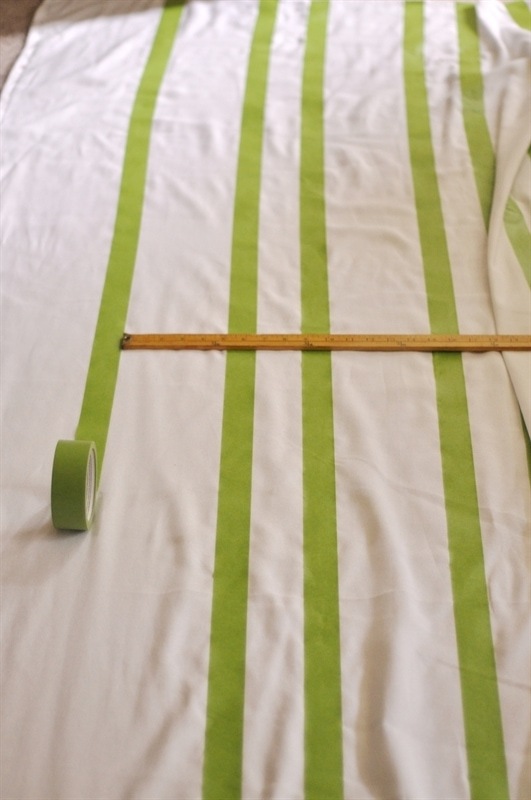 To create my stripes I used Frog Tape that I purchased at Home Depot. It worked great and gave me a nice crisp line. The most time consuming part of the project was taping off my stripes. I decided I wanted 5 inch stripes. 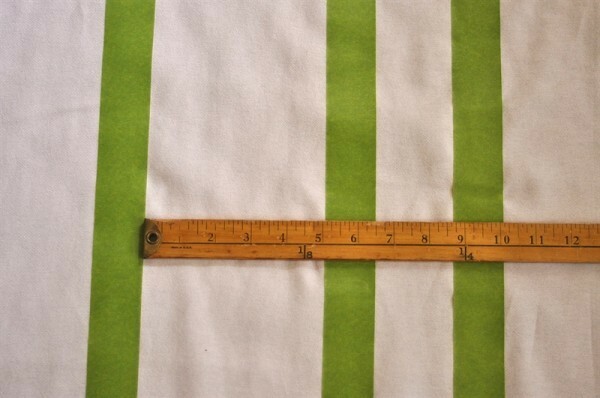 I chose 5 inches because the width of my tablecloth was evenly divided by 5 so my stripes would end up evenly. It took me a few tries to figure out the math. 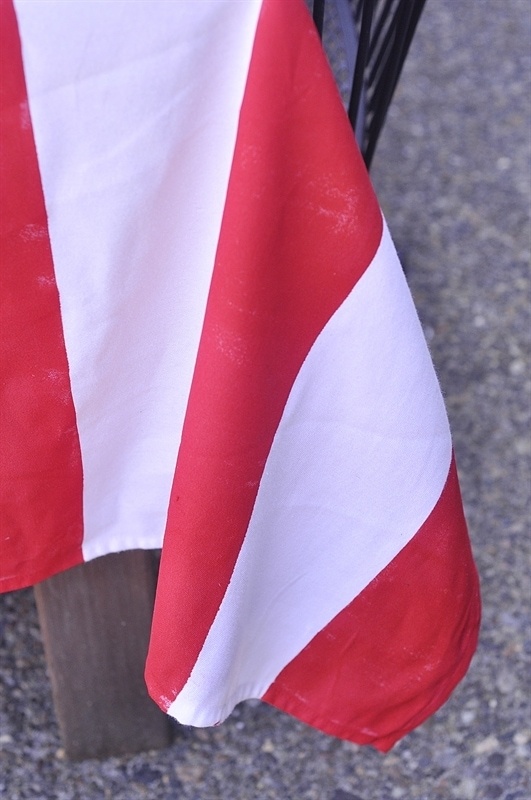 The red stripes measured 5 inches but the white strips were a bit different as I had to place the tape in the inside of the stripe, not the outside! 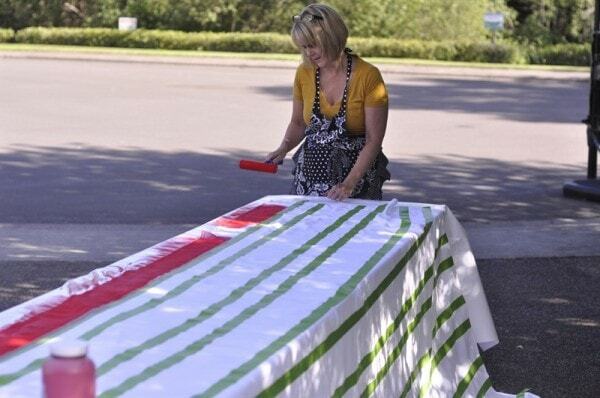 I lined up tables on my drive way and covered them with paper because the paint will come through the fabric. I used a small foam roller to apply the paint. Keeping the paint in between the tape lines is the biggest challenge and I must admit there are a few times I went over the line a bit. So if you are a perfectionist be sure and take your time!! I just decided it added character to the tablecloth! I enlisted a little help too and Tessa filled in some spots with a brush that I missed with the roller. All in all though I loved how it turned out and it looks perfect on my patio table. Fun, festive and ready for a party. I think I need one in another color now. 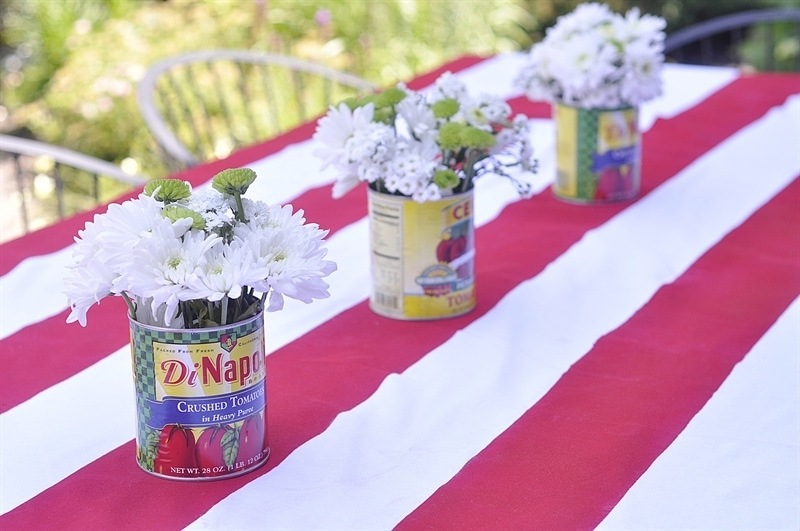 To add a little bit of quick decor I used some fun, empty tomato sauce cans I had in the recycling and some flowers form the garden. Got to love a pretty can! That’s so fun, LA! 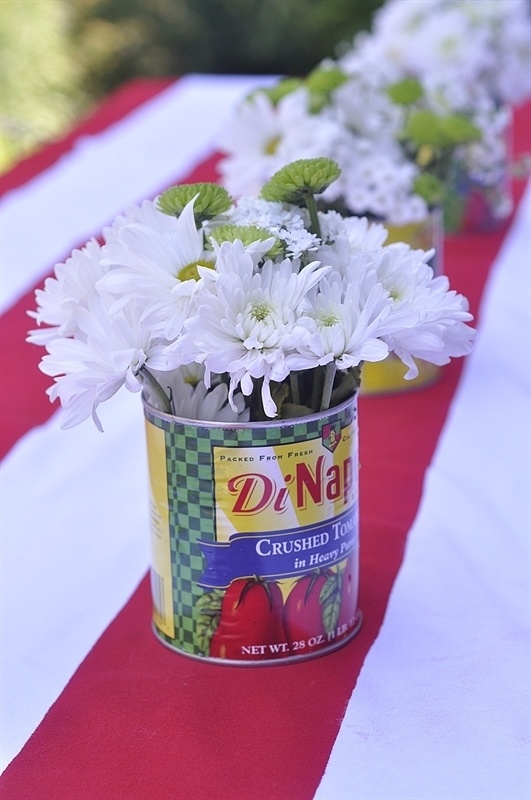 I love it… and I love your flowers in the cans. So cute. SO fun!!! I painted a fabric recently that didn’t quite turn out, I’ll look into that paint you ordered. It is hard to find textile paint in the craft stores (at least here in Oregon) and this online site has a great selection of colors. Definitely check it out. Prices are decent too. So cute!! I haven’t attempted to paint a big fabric project yet. But I love your tablecloth especially with the cans. Thanks Crystal. 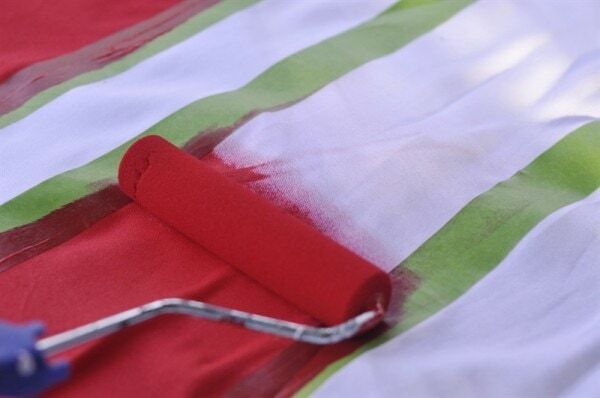 Painting fabric is easier than you might think! I love it LA! I used Frog tape for my project too and it worked like a charm. Red is my favorite color so I just adore what you did! That was my first time using Frog tape and totally impressed. Red is the color of choice at our house always! 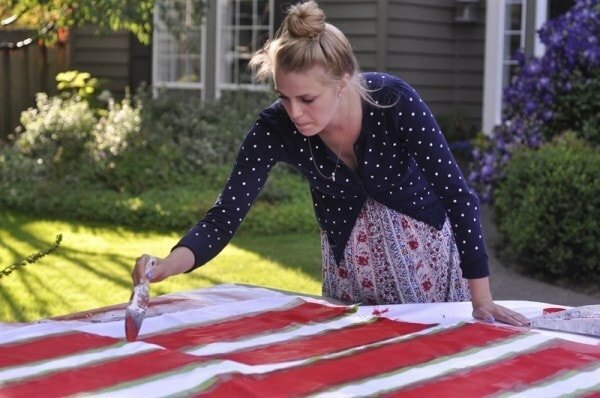 I love that you’re painting in a cute apron & your cute daughter is painting in an adorable dress, LOL! This tablecloth is so so cute! The colors rock! It’s all about the pretty at our house! And that is my adorable dress she is wearing! Love it that my daughter steals my clothes. Thanks girls!! What a fun and summery table! 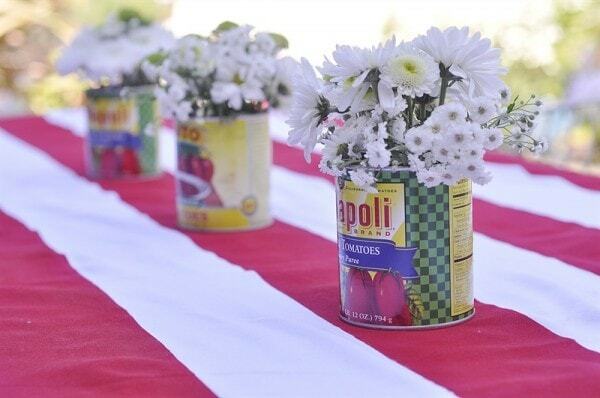 The tomato can centerpieces are the perfect touch for the bold red stripes. Thanks Kierste. We are big red fans at our house!! Even the boys. Awesome job Leigh Anne, it looks wonderful! I buy all of my fabric paints from Dharma Trading as well 🙂 We don’t have pretty tomato cans in Iowa!!! You should come to Oregon and get some :)! 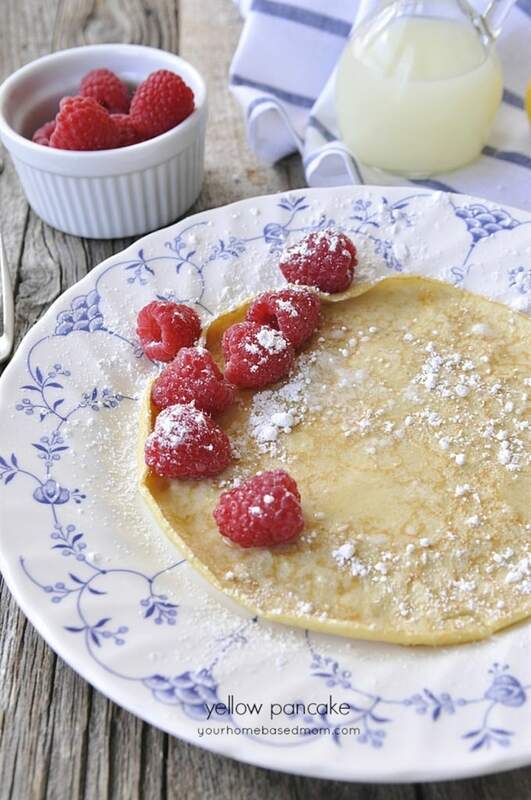 Great idea….Did the tablecloth wash well after use? We don’t have pretty tomato can in Pittsburgh, either. Love it!!! Was 1 (32 oz) bottle of textile paint just enough for 1 table cloth? I want to make 2, so trying to figure out how much paint to buy. Thanks! I had a little less than a 1/4 of a 32 oz. bottle left. Love this tablecloth!! It looks so fun and fresh and summery. 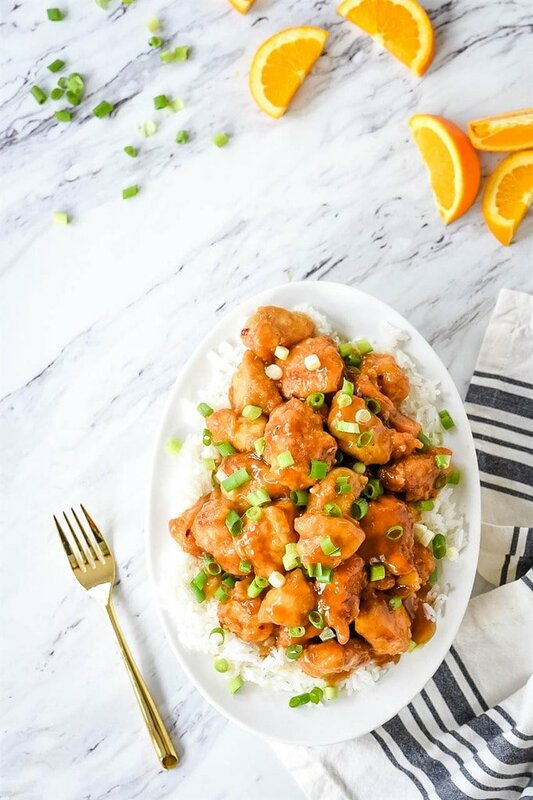 Found you on Pinworthy projects… definitely pinning! So glad you found me and thanks for pinning! Leigh Ann. This is such a great post that I want to highlight you again this week. Hmmm… I might be developing a blog crush 😉 See you on my Friday Flash Blog! Thanks girl – appreciate it!! 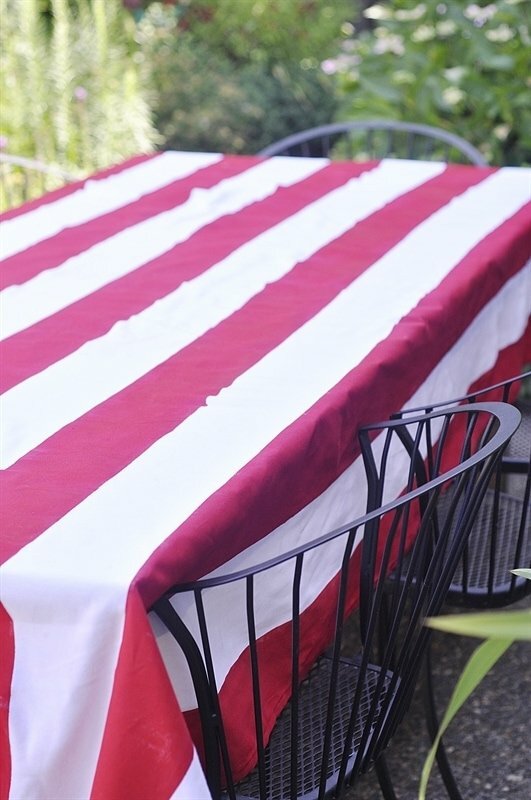 I love the striped Tablecloth idea. Its really simple and fun not just for adults but for kids too. 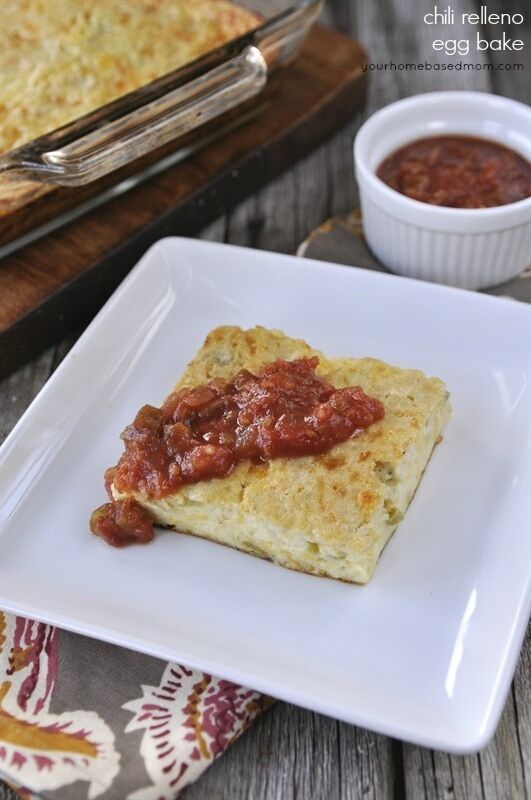 Stopping by from Jenney’s blog hop. 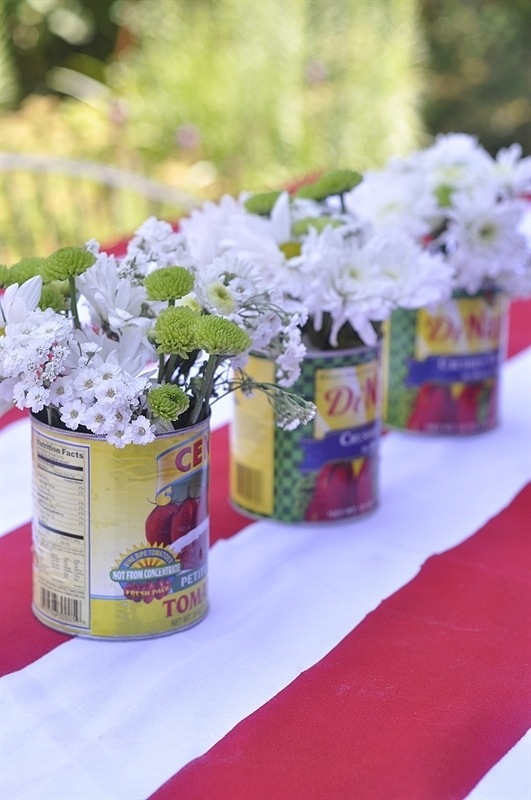 The flower cans are so cute, I just love this for a nice little picnic or BBQ. 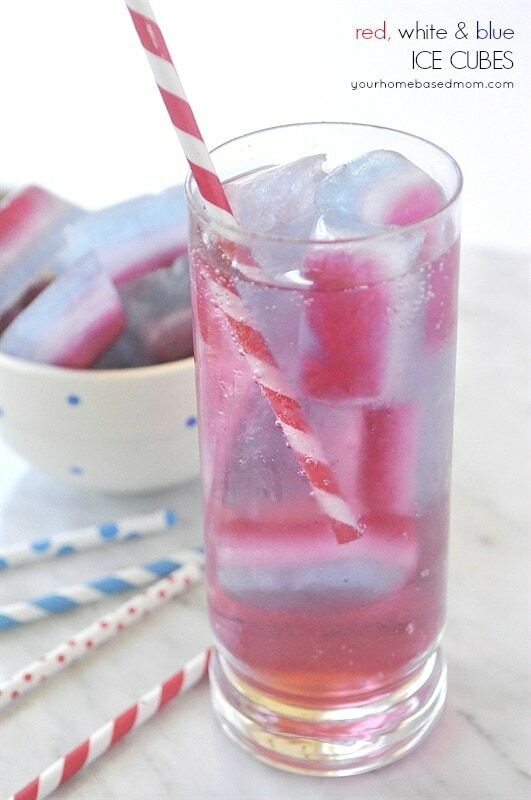 Add a pitcher of sweet tea and it perfect, haha. 1) Where else in the world were you going to find the perfect table cloth at the price you wanted? 3) It turned out looking fantastic and inspiring! Found this post through other folks you encouraged to give this a try, great work! I love this idea! 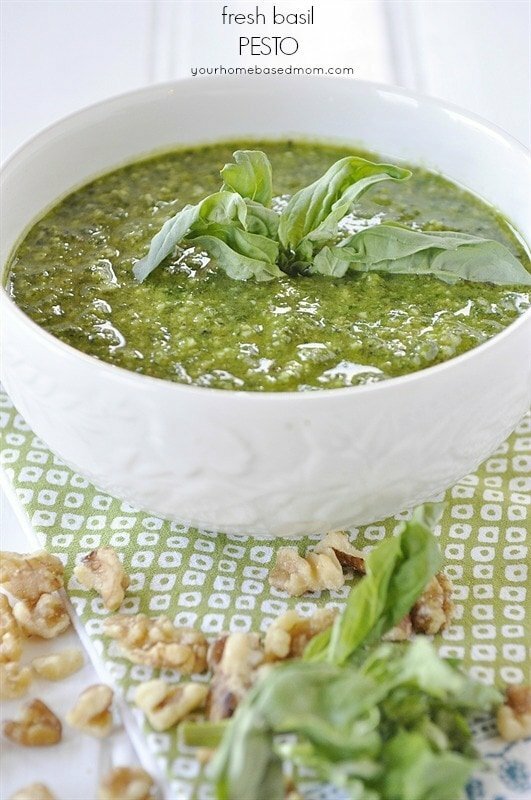 I would definitely try this out for an outdoor ocassion, even would make for a great tablecloth at a wedding using the colors. 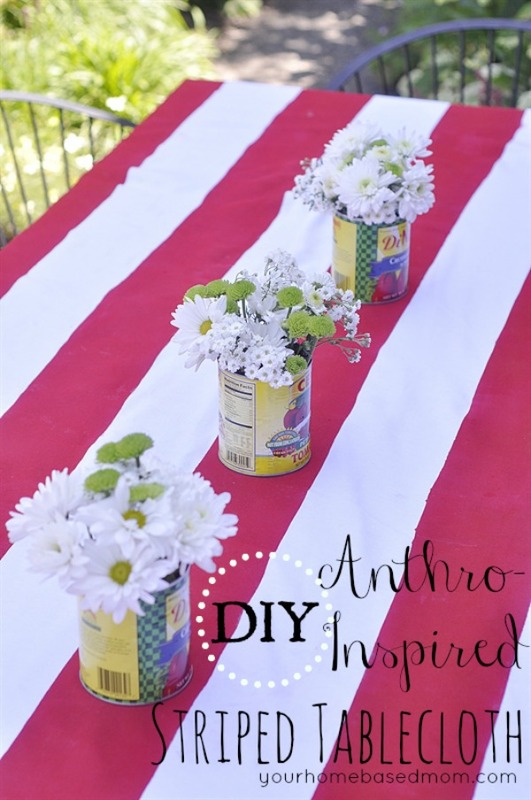 I love the flowers in the can on the striped tablecloth! What a fantastic look! The pink in the table cloth reminds me of these pink flowers I think they would look fabulous on the tablecloth as well.